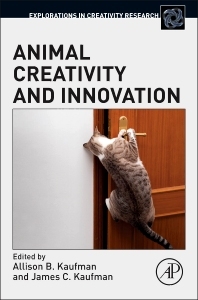 Commentary on Chapter 1: What Can Creativity Researchers Learn from Grey Parrots? Commentary on Chapter 4: Proto-c Creativity? Chapter 6. The Evolution of Innovativeness: Exaptation or Specialized Adaptation? Commentary on Chapter 6: Can Sol’s Explanation for the Evolution of Animal Innovation Account for Human Innovation? Commentary on Chapter 7: (How) Does the Cerebellum Contribute to Creativity? Commentary on Chapter 16: Insect Creativity as Applied to Human Organizational Behavior: A Form of Social Biomimicry? James C. Kaufman, PhD, is a Professor of Educational Psychology at the Neag School of Education at the University of Connecticut. He is the author/editor of more than 30 books and 250 papers. Dr. Kaufman co-founded two APA journals (Psychology of Popular Media Culture and Psychology of Aesthetics, Creativity, and the Arts) and is a Past President of APA’s Division 10. He was won numerous awards, including the Torrance Award from the National Association for Gifted Children, the Berlyne and Farnsworth Awards from APA, and Mensa’s research award.